The situation of helplessness and youth unemployment is an unacceptable scourge for the people of the second decade of 21st century. 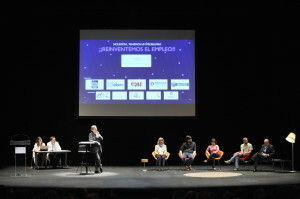 As a result of a sound innovative and entrepreneurial drive, endorsed by 34 years of work in the field of reflection and action, functioning as a bridge between youths and companies, we at the Novia Salcedo Foundation (NSF), whose headquarters are in Bilbao (Basque Country, Spain) we believe that the solution to the big problems that global society is facing needs to go hand in hand with big and feasible dreams. In this dream, action-solution, we suggest beginning with a proposal for economic and social change on three levels – people-organisations-society-, towards one more inclusive. And we make this proposal taking as a guiding thread the integration of youths in the human, economic and social development by launching specific actions on a global scope, compatible and complementary with those of a local scope in order to reduce youth unemployment that we face across the world. Therefore, we are talking about an important exercise of Social Innovation at a global level. From this reflection the following proposal was born: we must look at the severe crisis of youth unemployment as an opportunity for social and economic transformation of organisations and countries. Encouraged by the Declaration that 2014 is the ‘International Year of Family Farming’ as proposed by the World Rural Forum, as the first initiative of the civil society that gets the United Nations General Assembly to declare an international year, we have launched a Campaign whose objective, besides highlighting the issues about youth unemployment at the highest institutional level, is about providing content, defining priorities, action lines, good practices and performing regional analysis, within the economic, social and political spheres that affect youth employment. An International Campaign with a final goal: to place youth unemployment on the Global Agenda of Human Development through the Declaration of as Youth Employment Decade by the General Assembly of the United Nations. We want to launch the machinery in which we can integrate the problems of youth unemployment. We can, and we know how to project ourselves even further outside of our geographical area and we are certain that civil society has enough arguments to act decisively in this field.